Joint Doctor became famous by their Lowryder. This cannabis strain has conquered the world and is extremely well known. They regularly work with other breeders to develop new strains. Joint Doctor only delivers feminized autoflowering seeds, these cannabis seeds are of extremely good quality. 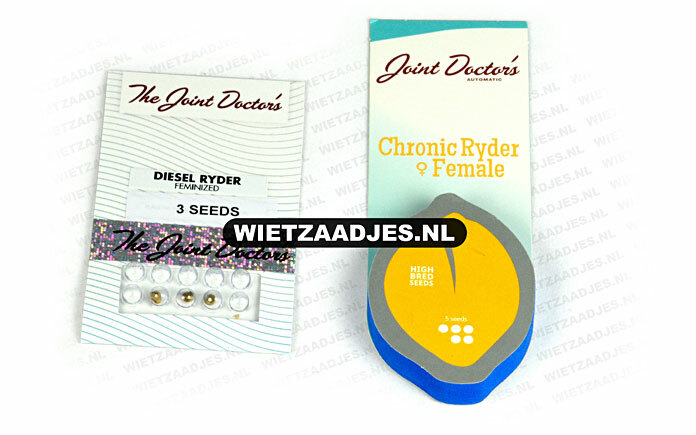 Chronic Ryder from Joint Doctor is an autoflower cannabis plant that is originated from a nice crossing. These cannabis seeds are suitable for an indoor and outdoor grow. She has an average content of THC and is suitable for the growers with some experience. Diesel Ryder from Joint Doctor is the autoflower version of the most popular strain in America, the Diesel. This nice autoflower cannabis plant is suitable for an indoor and outdoor grow. During the flowering period this cannabis plant could produce a reasonably strong smell. Easy Ryder from Joint Doctor are autoflower cannabis seeds that are originated by crossing two very famous and powerful cannabis plants. This autoflower cannabis strain generates the best results with 20 hours of light and 4 hours of darkness. This cannabis strain is suitable for an indoor and outdoor grow. Lowryder 2 from Joint Doctor are autoflower cannabis seeds that are originated by crossing very famous and good cannabis plants. This cannabis strain has a delicious and relaxed effect. Everybody with some growing experience could grow this cannabis strain succelfully. Purple Ryder from Joint Doctor is an autoflower cannabis plant which generates a nice purple color during the flowering period. This autoflowering cannabis strain is suitable for an indoor and outdoor grow. This cannabis has a reasonably high content of THC. The big advantage of this cannabis plant is that she does not has a strong smell. The Ogre from Joint Doctor is an autoflower cannabis strain which contains mainly Sativa genetics. This autoflower plant becomes a lot bigger than the average autoflower plant. This cannabis plant becomes large and wide and produces a high yield. This cannabis strain is suitable for an indoor and outdoor grow. Het merk Joint Doctor is een bekend merk die alleen maar feminised autoflower wietzaden levert. Ze hebben verpakkingen van 3, 5 en 10 zaden. Ook kun je deze wietzaden bij ons per stuk kopen, we verpakken deze zaden dan handmatig in vochtvrije 'microfuge tubes' met duidelijke labels. De verpakking van Joint Doctor kan verschillen wanneer je kiest voor een ander aantal of andere soort dan dat op de afbeelding staat. Van de autoflowering soorten biedt dit merk de soorten: Betty Boo autoflower, Chronic Ryder, Diesel ryder autoflower, Easy ryder autoflower, Lowryder#2 autoflower, The OGRE autoflower.